GPSU (GPSü) helps customers get access to land for development or investment opportunities in Australia. Our mission is to deliver land access solutions whilst enhancing our customers’ Goodwill from within the community and with external stakeholders including government departments, affected owners and traditional owner groups, so that these stakeholders will be more likely to support (than oppose) our client’s projects. Our Project services include developing property project strategy for delivery of our land access, acquisitions, cultural heritage, native title and due diligence services using our consultant’s extensive experiences in each. Goodwill Project Solutions are therefore the solutions that we develop by combining our ‘Goodwill’ approach to engagement, with our project management and technical expertise in delivering our services. 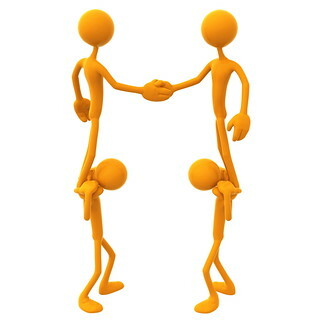 The U of GPSU importantly recognises you (our client) are our ultimate focus and most important stakeholder relationship. Hence we often choose to add the character above the U for more emphasis on Ü. We appreciate that your planning for projects is often sensitive, particularly in the earlier stages so we offer a more personal relationship with our clients than our bigger competitors, where our clients can rely on our integrity of being a vault for confidentiality. We aim to become your most trusted property project advisor known for representing and promoting your interests and building bridges to sustainable relationships and agreements with stakeholders with interests affected by your developments. QLD the land of big hearts – could Petrie get the next icon? “Richmond Bridge is a lasting symbol of Tasmania’s convict heritage. The sandstone arches of Australia’s oldest known large stone arch bridge have spanned Tasmania’s Coal River since its completion in 1825. Built by convict labour, the Richmond Bridge reminds us of the forced migration that contributed to the development of Australian society.” Department of Environment – summary of this National Heritage Place listing. Do you need a bridge builder to connect with stakeholders for your projects and property dealings? 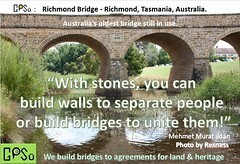 If so, please lay the foundation stone here by contacting GPSü as we build bridges to agreements for land and heritage. Quote on peace builders and bridge builders.